One of my all time favorite things to do is to sit around our fire pit in our backyard or the campfire while we are camping. And usually, for the next few days the smell of the fire and smoke stay with me even after washing my hair a number of times. I have a love/hate relationship with the smell of smoke. 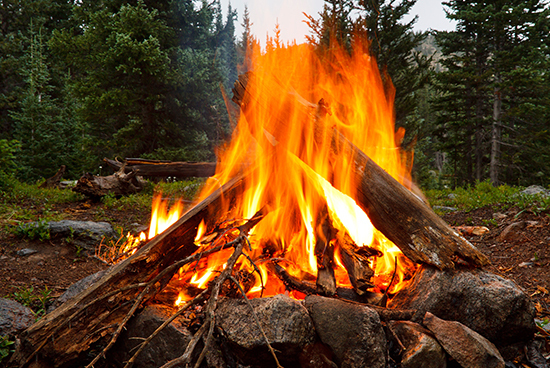 When I do catch a whiff of the lingering smell of smoke in my hair, it brings back the memories of sitting around the fire with family and loved ones. But then, while I’m sitting at work and a co-worker is standing by me and I smell smoke, I think “They must be thinking ‘Does she ever bathe?! '” Lol. So many times I, like other believers, pray that God would spare me from unpleasant and painful situations. I’ve been lulled into this thought that my life should be pretty easy, carefree and comfortable. But the reality is this: life is painful! Life is not always easy! I will go through and have gone through some pretty difficult times in the past few years. And even though God did not spare me (and other family members) and prevent me from going through these times, I know for certain that just like Shadrach, Meshach and Abednego, God was walking right beside me in those “fiery” times. Shadrach, Meshach and Abednego had the ropes that bound them burned off while they were traipsing around the furnace and that got me thinking “What ‘ropes’ were keeping me bound while I was walking through painful times?” Maybe the “ropes of unbelief“: Why would God allow this to happen to me? Isn’t He a good God? This doesn’t feel very “good” to me right now! Maybe the “ropes of doubt”: Does God really know what He’s doing?! Do I really trust Him to see me/us through this time of being uncomfortable? this time of being in pain? this feeling of being lost? of feeling abandoned? How about the “ropes of anger”: How could You possibly allow this to happen? “Ropes of pride”: I’m/We’re one of your children and THIS is how You choose to treat me/us? I’ve been living a pretty good life testifying to how I believe you and THIS is the thanks I get?! As you can see, I should have bought stock in a rope company!! And just like our three heroes of the Old Testament, it sometimes takes a fire to burn off these ropes that keep our hands, our feet, our hearts, and our minds bound. And just like our fire walkers, we realize that no, maybe God didn’t deliver us from having to go through these fiery times of pain and hurt, but we know without a doubt, that we didn’t traipse through that fire alone. God didn’t keep us from going through it but He certainly was right there the whole time. Oh and that favorite part of that verse: “there was no smell of fire on them”? The Holy Spirit gently taps me on the shoulder and reminds me that even though I have walked through some fires in my lifetime, because of His presence and His grace, people won’t be able to tell that I’ve gone through the fire. Because instead of the lingering smell of smoke on me (and in my hair), they will only be able to smell the sweet smell of Him saving me by grace and walking beside me while we both watched those ropes disintegrate and disappear. Yeah, every once in a while I pick up those familiar ropes again and start wrapping myself up in them. But soon enough, the Holy Spirit reminds me of what it took to burn those things off. I can stop and remember that even though I had to go through those times, I’m not the same person who was thrown into that fire and I’m certainly a different person after I came out of that “furnace”. And with that being said….who wants some s’mores!! I’ll grab the lighter and the marshmallows! !